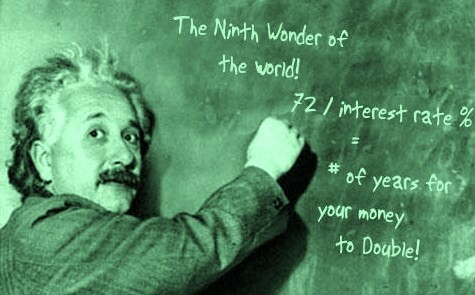 Compound Interest - Friend or Foe - Part IEliminate The Muda! This is the first of a two part post exploring Compound Interest – Friend or Foe. 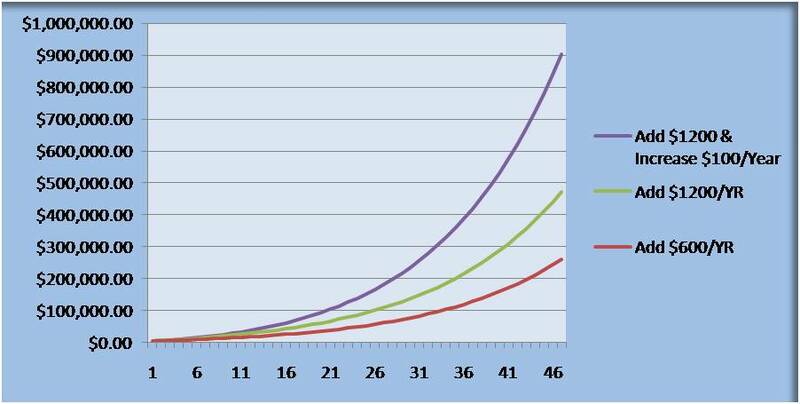 Compounding interest is a very powerful, over time; a tool that you can be used to your benefit or to your detriment. Compound interest is defined as the interest on an investments interest plus the previous interest amount. Taking a very simplistic look to understand compound interest; assume you invested just $100 in a savings account that earned just 1% interest. In one year’s time you would have $101. The following year you would be earning 1% not only on your original $100 but also on the $1 you had earned in the previous year. Obviously a $1 gain is not enough to get excited over. In the real world you will hopefully be able to invest more than $100 a year and you will hopefully earn more than 1% interest. An extreme example that is often used to highlight the long-term power of compound interest comes from a fable about the inventor of the chess board. When the game was presented to his king, the king was so impressed he offered the inventor the reward of his choice. His choice was a grain of rice for the first square on the chess board, two on the second, 4 on the third, 8 on the forth and so on. The king ordered the treasurer to pay the reward. Within a month the kingdom was already running out of rice having provided over 220,000 pounds or rice to the inventor. If the kingdom could continue to pay out, by the time they got to the 64th day it would be over 1 quadrillion pounds of rice! That’s more than is produced in a whole year worldwide. Reading between the lines, the fable highlights the two important factors in the power of compounding interest. One is the rate of interest, the larger the rate the bigger the return. For example if you invested just $2000 at the age of 25 letting it grow until you retired at 72 and earned a 7% annual rate of return you would have $48,091. However, if could earn 8% you would retire with $74,464 or roughly 50% more money over 47 years with just a 1% increase in interest. Second is the length of time that the interest is compounded. The factor of time is the key to creating substantial returns. This means your greatest opportunity to build wealth comes from starting as early as possible. At the age of 25 if you invested just $2000 in an account that pays 8% interest; at a retirement age of 72 you would have $74,464. However, being young and thinking you have a long life ahead of you to save you might wait 5 years to begin investing. If you wait just 5 years and then make the same investment of $2000 you would only have $50,679 at 72. It’s amazing to consider… your money invested for about 10% less time reduces your retirement account by nearly 32%! If you can increase the rate of return or increase the length of time you invest, you will substantially increase your wealth. But what if you were to do more than just invest a measly $2000 when you are young? What if you added more to your retirement account each year? This chart below shows three examples. Each is with a 7% annual rate of return over a 47 year period but each has additional monthly contribution. The first series adds just $25 each month, the second series has $100 added each month but series 3 starts in the first year with $100 each month but then increases the amount by $100 more each year making the assumption that your income will grow and therefore your investment contributions will also rise. In the early stages of your investing life it is hard to see the benefits of compound interest. Only after remaining committed to your plan for an extended period of time do you really see it begin to pay off. Starting at 25 years old with just $2000, adding another $1200 the next year and increasing your annual contributions by another $100 each year you will retire nearly a millionaire. A couple thousand a year is nothing! Most advisors suggest you contribute 10% of your income to your retirement plan. Based on my principal fo financial management #4, you need to contribute closer to 20% if you really want to guarantee a comfortable retirement without worrying about the stability of Social Security, the state of the economy, healthcare costs or if your company will provide a pension. If nothing else, understand this, if you don’t start early you are wasting a valuable opportunity to build signficant wealth. LLC – Do you think most advisors advise saving 10-15% of their income into savings on top of maxing out their 401K’s? Or are advisers just talking about putting 10-15% into your 401k? I’m just trying to understand what the default advice is? I’ve always believed that maxing out your 401K is a given, and 10-15% is additional savings, but I might be wrong. My interpretation has always been that most advise a total percentage of income. In virtually every example I have seen they only talk about saving 10-15% and then speak of taking advantage of 401K’s first as a best practice of what to do with savings. I like your advice, and plan on getting there! Currently I max my 401K and then still save more, but if I can get to 10-15% after a 401K max I will be a very happy man! Solid article and definitely can assist with understanding the subject much better. Compound Interest – Friend or Foe – Part II « Eliminate The Muda!